How many times have your beliefs been challenged? How have you felt and what have you done then? 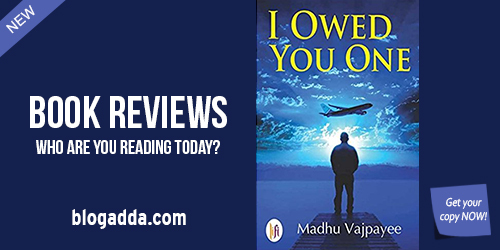 I Owed You One by Madhu Vajpayee is a Contemporary Fiction that shares the story of Dev Khanna who has it all, before a mysterious letter shakes the very foundation he has built his life on. It is the story of promises and commitments, of triumphs and defeat, and of holding on and letting go. If you love reading such stories, don’t miss this one! We have 10 copies for all the members of the Book Review Program. Apply Immediately if you are interested! Dev Khanna has a perfect life with his loving wife Radhika and son Neel in Melbourne, Australia. But there is something from his past that keeps gnawing him, an open wound that is a reminder of a debt. His present is very flourishing and future promising but what happens when the past comes knocking? As the skeletons begin to tumble one after other from the cupboard, it is now threatening his present. Join Dev on a journey that spans across the tall skylines of Melbourne, the royal Dilwalo ki Dilli to the dingy lanes of Moradabad as he battles love, religion, politics and fear questioning his own beliefs at every step. Will he be able to make peace with his past and save his future? Will humanity lose this battle against everything else? Dr. Madhu Vajpayee, the writer was born somewhere in those hospital corridors where she has spent the last two decades of her life. Witnessing life at such close quarters pushed her to capture its enigma in her words and slowly it became her passion. After writing several scientific papers and chapters in books, this book is her second step in the literary world. To be able to review this book, you need to be a registered member of BlogAdda and your blog should be approved by BlogAdda. You should also have signed up for the Book Review Program. If you have already signed up, then head over to let us know your interest in reviewing this book. I would like to know more a outvoted Sponsored review programme too. Where do I find the info for the same? Do let me know. Have you applied for the book? Hello, this book is in English can I write review in Hindi in my Hindi blog?